You can smell the flood, the after-effects wafting from the closed hotels and shops. In the river a snapped tree juts sideways into the air. Reconstruction, sacred areas cordoned off, inaccessible for now. Thankfully the Grotto is open. There’s an overwhelming innocence in the unpretentious humble pilgrims. A recently born baby in her father’s arms, toddlers, normal modern young women and men, the old, the sick; every race and nation. A lot of Indians and Vietnamese. We file along the base of the Grotto, touching the rock made smooth by millions who touched it before us, wiping ourselves with the water that seeps there. Time was when I would have been too sophisticated to engage in this. Sophistication has thankfully abandoned me and I abandon myself to the grace of the present. 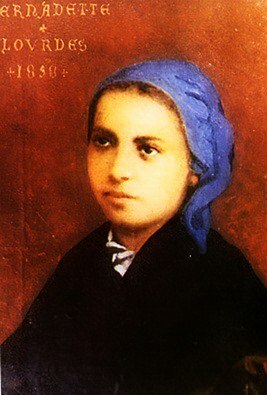 I kneel in the spot where St. Bernadette prayed and my prayer is intense, sad with the sorrow of those I’m pleading for. It is incredibly beautiful and peaceful. A strong breeze blows down the rock rustling the leaves, blowing out the candles that the attendant is trying to light. I always feel that Mary is present in the breeze in the trees but I wonder would she extinguish the flame on the blessed candles that represent so much of the sorrow and the joy of her people. And I wonder about the floods that destroyed this place twice in two years. Nothing is as it should be. There’s turbulence, conflict, a spiritual warfare going on not least in Ireland where everything sacred, including life itself is trampled upon in the name of progress. The wolves are scratching at the door of all that is holy. Angry is how you would describe the river. It runs fast and high and green. It too reminds us that it burst its banks once and could do so again. And still there is peace and joy and hope here in the Grotto. Indian Catholics boldly declare themselves; the Koreans are laughing; the French singing; trapped birds and the free are chirping with all their might. 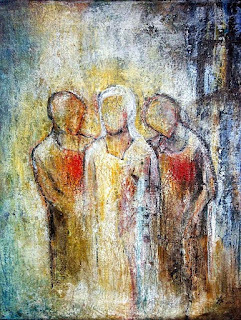 The morning is frantic with Eucharist, Mass being celebrated in every available place, true devotion of multitudes, their sounds infiltrating the Blessed Sacrament Chapel where I have sought silence. This is the Tent of the Presence of God, the Meeting Place. Our day will settle down in a while! It’s lovely to observe the young who are keen to stand or kneel in the spot where St. Bernadette knelt when she first saw Our Lady. Do they find a connection in the spiritual experience of one as young as themselves? 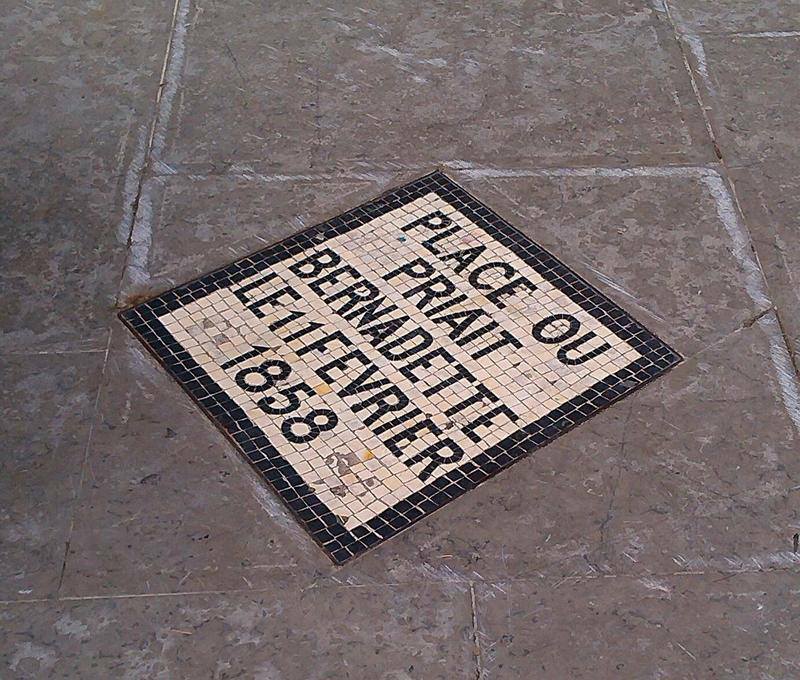 The place where St. Bernadette prayed! In the evening I was sitting near this spot again before the candle light procession. 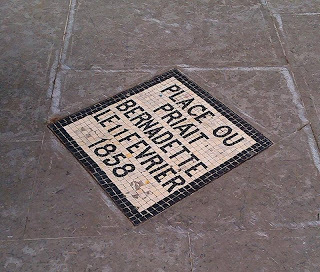 A young couple came and knelt there close to the spot where the miraculous spring emerged. He took a little box from his pocket, opened it and there was a ring inside. Without a word he took her hand and placed the ring on her finger. She smiled and then started to cry. They both cried and embraced a while. Then they prayed in silence for a long time. There is love in Lourdes – so much love! When it was time for me to leave I bent down to wish them God’s blessing. She reached up and kissed me on both cheeks. I gave him a hug and went off to join the procession. I was the silent witness to love, the ultimate treasure of the human heart.